How many trees on campus predate the university? Although there are many large trees on the Vanderbilt campus today, how many of them were actually here before the university was founded in 1873? Obviously there is at least one: the Bicentennial Oak is believed to have sprouted in the latter half of the 1700’s. Fortunately, the university archives has preserved a number of photos from the early years of Vanderbilt and an analysis of those photos can provide at least a partial answer to this question. Below are several panoramic photos from various times in Vanderbilt’s history with recognizable landmarks marked on them. The final image shows the approximate locations where the photos were taken and includes viewlines to the marked landmarks. The angles between the viewlines are used to assess the conjectures about particular trees. 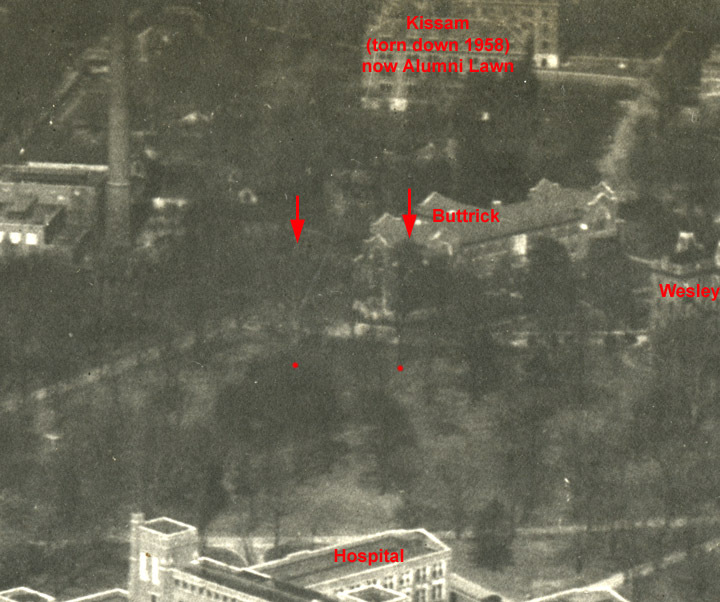 It is clear that there were few large trees in the vicinity of what is now Kirkland Hall (the original property has been described as “a cow pasture”). In the background on the left is the homesite of the original farm. Unfortunately, the photo does not extend far enough to the left to provide a view of the Bicentenial Oak. The building now known as “Old Main” was the original farm house. Benson Science Hall (which would now obstruct the view of Old Main from this location) had not yet been built. Behind Old Main are several large trees that are probably large oaks known to have been near the building. To the left is the Garland Oak. As shown in the sight line analysis below, this tree is in a position in the photo that is consistent with the known location of the tree. 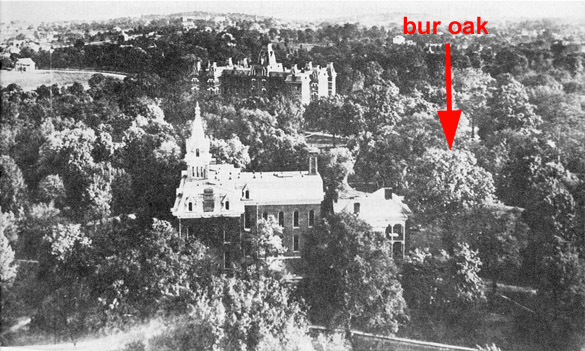 Just to the right of the building is the large bur oak that grew near Old Main (see images below). It fell over in the 1989 and did significant damage to the building (Vanderbilt Register vol.X no.2 p.5, Sep. 15, 1989). A count of tree rings estimated that the tree sprouted before 1800.
source: The Vanderbilt Campus: A Pictorial History by Robert McGaw, p. 137. Photo courtesy of Mary E. Landreth Parker. Twenty years later, the fruits of Bishop McTyeire’s tree-planting campaign can now be seen. The space between Kirkland and Benson Science Hall is now filled with trees. However, a much larger tree in the appropriate position to be the bur oak is visible just to the right of Benson. Comparison with the 1875 photo shows that this tree has the same shape and branching pattern as the tree believed to be the bur oak on that photo. Barely visible behind Benson is the top of a tree that might be the Garland Oak. To the left of Benson is a clump of trees that towers above all the others. This clump is in the correct position to include the Bicentennial Oak. 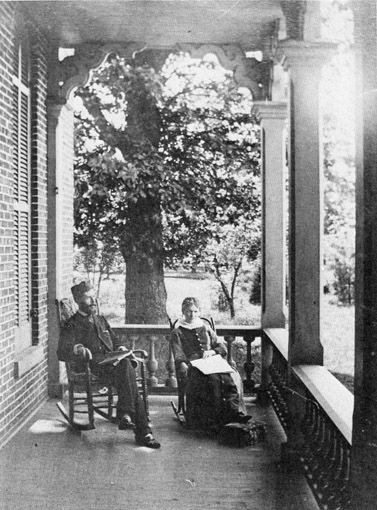 source: Vanderbilt University Photographic Archive in McGaw, Robert A. 1978. 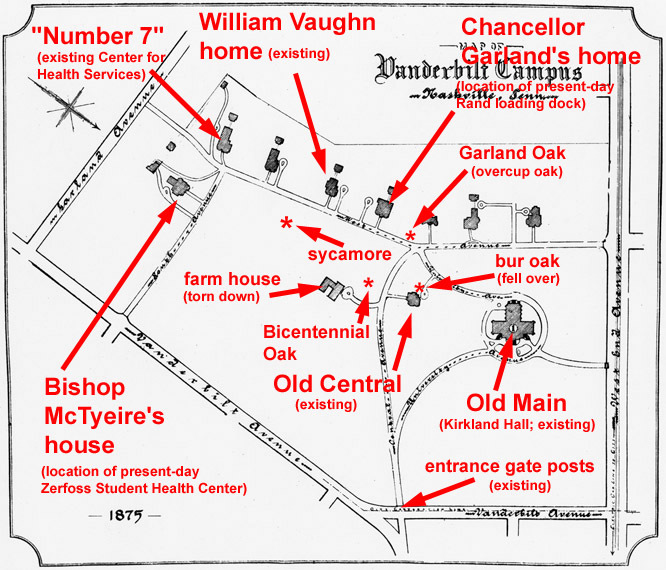 The Vanderbilt Campus: A Pictoral History, Vanderbilt University Press, Nashville, p. 140. Trees at the location of Stevenson Courtyard, 1961 Two trees marked by arrows tower over surrounding trees. Sycamore visible to their left. source: Vanderbilt Campus Planning and Construction, Facilities Information Services. 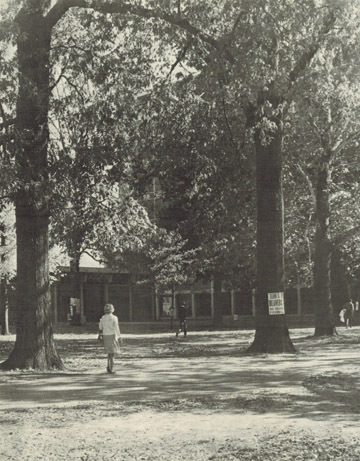 The Vanderbilt Campus: A Pictoral History by Robert A. McGaw notes that “big trees older than Vanderbilt shade Stevenson Center’s upper courtyard”. We don’t know the basis for McGaw’s statement; however, he was a long-term observer of Vanderbilt’s trees and was familiar with most of the trees on campus. The trees in that area would probably be hidden behind Wesley Hall (the imposing building behind Old Engineering) in the 1890-1900 photo above, so it isn’t any help. 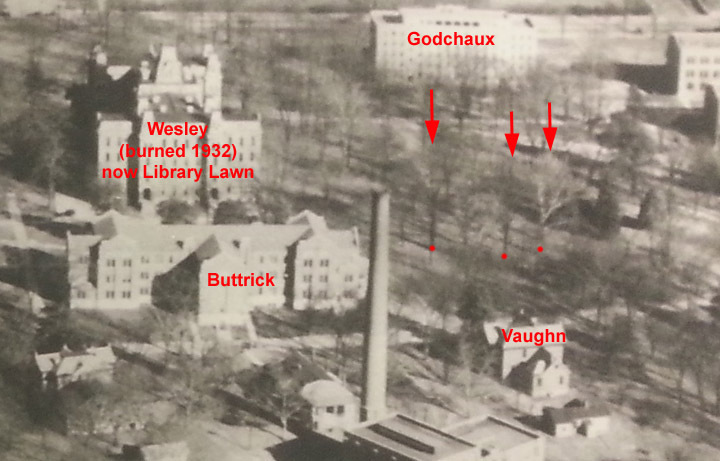 The big trees in Stevenson Courtyard can be recognized in two aerial photos of the campus taken about 1930. The sycamore is apparent due to its white bark illuminated by the winter sun. It is clear from these photos that the three trees were large in 1930. They may have been large enough to have been more than 55 years old at the time and thus predate the university. 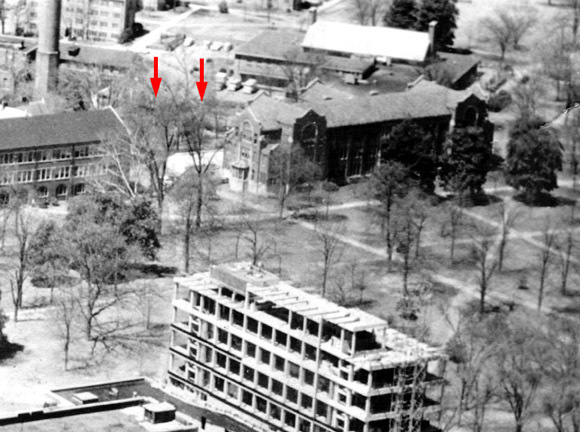 Sometime between the publication of McGaw’s book in 1978 and now (2014), two of the trees died and only the sycamore remains at that location as a candidate for “big tree older than Vanderbilt”. View of Vanderbilt Campus from the west, c. 1930. Arrows mark tops of trees found in Stevenson Courtyard in 1978. Dots mark approximate location of bases of trunks. Sycamore on right. View of Vanderbilt Campus from the east, c. 1930. Arrows mark tops of trees found in Stevenson Courtyard in 1978. Dots mark approximate location of bases of trunks. Sycamore on left, middle tree not distinguishable. source: Vanderbilt University Special Collections and University Archives. Today it is difficult to see more than the tallest parts of campus buildings because the trees planted over a hundred years ago have now grown so tall. Nevertheless, the clump of trees to the left of Benson is still noticeably taller than most other trees in the old part of campus. Although the exact identities of individual trees hasn’t been determined on this photo, the probable location of the Bicentennial Oak has been marked. What this analysis makes clear is that there are probably few (possibly only one) remaining trees on Vanderbilt campus that predate the university. 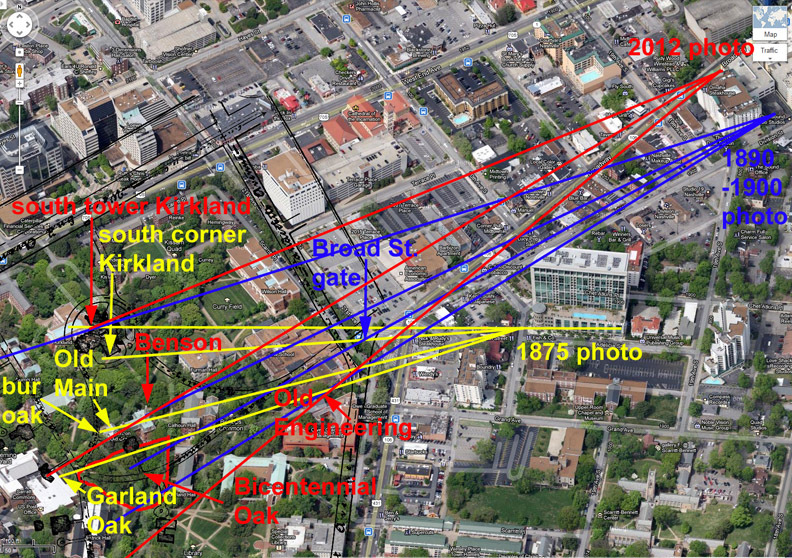 This image shows the approximate positions of the 1875 and 1890-1900 photos and the position of the 2012 photo. The position of the Broad Street gate, whose posts are still presentbetween the Law School and 21st Avenue, was critical in establishing the positions of the older photos. The names and arrow colors on this image correspond to those used in annotating the images above. The clump of large trees south of Benson/Old Main is outlined in red. This is the clump visible to the left of Benson on the 1890-1900 and 2012 photos. What Are The Biggest Trees?